The Australian dollar notched up a second day of rises against the greenback today. AUD/USD propelled upwards towards 0.7435 taking the level well clear of the deep low of 0.7327 that was reached last week. 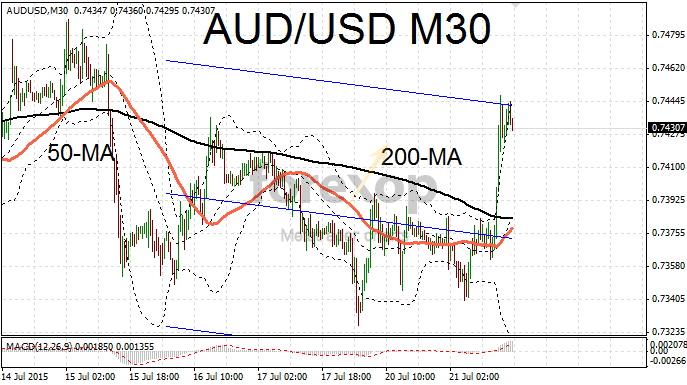 AUD/JPY also led the way higher moving up above the 92 mark for the first time in three days. 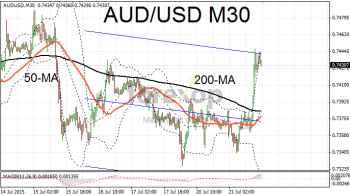 Moving the Aussie higher was a wave of profit taking in the lead up to a speech by the Governor of the Reserve Bank Australia later this evening (as well as tomorrow’s rate decision by the RBNZ). The speech will coincide with the release of the latest official consumer inflation data. The publication of the minutes from the last interest rate setting meeting has helped to stabilize markets which are extremely nervous of the possibility of another round of interest rate cuts. The minutes revealed that the board sees the current level as appropriate. As before the committee said that future decisions will remain “data dependent”. They also reiterated that depreciation in the currency rate is both likely and necessary. It is also worth noting that the meeting did come before latest turmoil seen in Chinese financial markets. New Zealand’s dollar also made nervous advances against the greenback and against the yen. NZD/USD advanced strongly for a second day taking the rate up to 0.6641. The pair has passed resistance at 0.6627 but the overall direction hangs on Wednesday’s interest rate decision. Markets are pricing in a chance of a rate cut of between 25 and 50 basis points with a 25bp cut being the most likely. This would take the official cash rate down from the current level of 3.25%. Given the pressure that the New Zealand economy is under, a 50 basis point cut cannot be ruled out completely. Metals made a modest turnaround early on but still remain in a precarious position. Crude also appears to have found a temporary floor around $56 per barrel. Wednesday’s crude inventory report is expected to show a slight decrease on the week of 1.2M supply barrels.